What is the notifications area? Notifications area is located on the top right hand corner of the menu bar beside the gear icon (see A). A red badge appears when you receive a new message and they appear in a list (see B). Next Actions: When a Next Action has been assigned to you by another team member for one or more contacts. Contacts: When contacts have been assigned to you by a team member, bulk update, import or lead generating form such as Wufoo, MailChimp forms or Unbounce. Unassigned emails: When an email sent to your OnePageCRM email dropbox address needs to be assigned to a new or existing contact. Mark all as read: Quickly marks all notifications as read and removes red counter icon (see C). Unassigned Emails: Opens Notifications page and displays unassigned emails (see D). 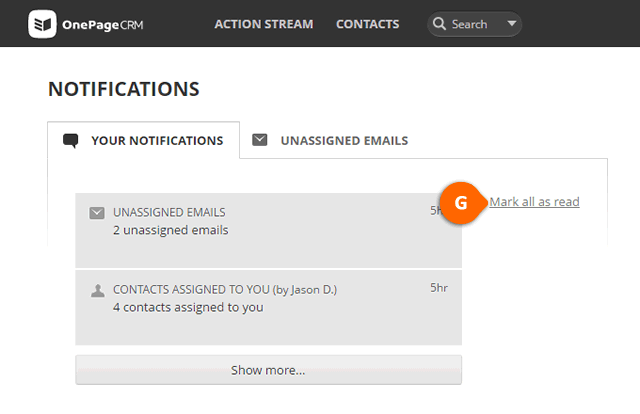 Viewing an individual notification: Clicking on an unassigned email notification brings you to the Notifications page. Clicking on a contact notification brings you to the relevant contacts (see E). See All Notifications: Opens the Notifications page for viewing and managing all notifications (see F). What to do in the See All Notifications page? Under See All Notifications > Your Notifications, it is possible to view each individual notification or to Mark all as read (see G). Under See All Notifications > Unassigned Emails you can see all unassigned emails for your contacts. Assign an email to an existing contact by entering their name into the field (see H) and click Assign. Create new contact or Delete the email (see I). Delete all unassigned emails in bulk (see J).